When I left off last week I had cut out some of the seat top planks but I wasn't entirely sure how I was going to fix them in place. 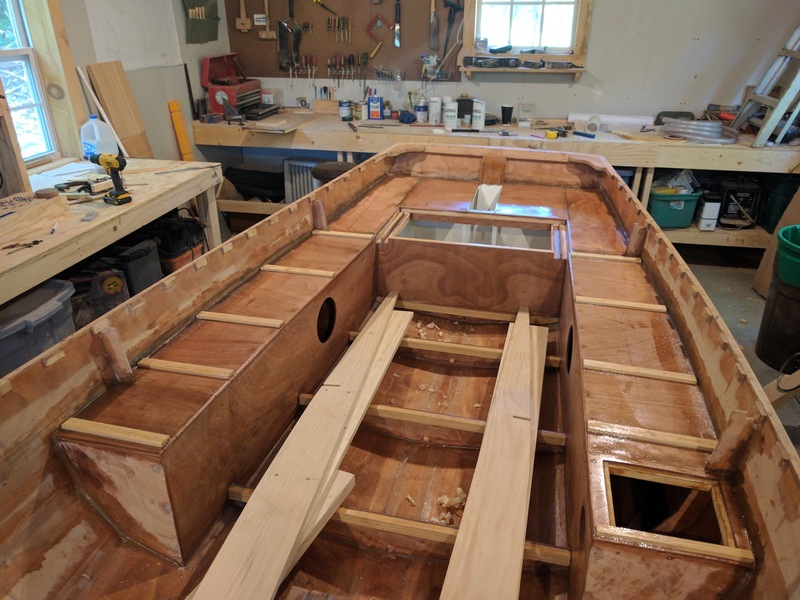 On the woodenboat forum (here) I had a number of good suggestions with various methods that would not require me screwing them to anything, which would be ideal, but after a number of tries with various temporary fasteners I pretty much gave up and went back to the original plan. 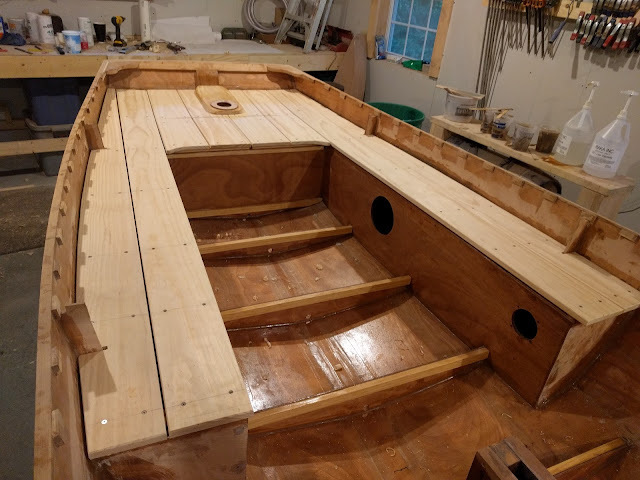 I did learn a new term along the way though, the strips that I intended to epoxy in place to hold the seat tops were called 'cleats'. So with my new terminology in hand, I got to work. First I tried cleats that were 18 mm tall, but once I put everything together, it just didn't look right. I called my wife over to the shop who seems to have a good eye for all things aesthetic and she thought that the cleats were too prominent. She suggested making them a little less tall. So I cut them down to 10 mm and both of us felt it looked much better so I went ahead and glued them all down with a thickened batch of epoxy and called it a day. The next morning before work I coated the newly glued down cleats and all the seat tops with unthickened epoxy. 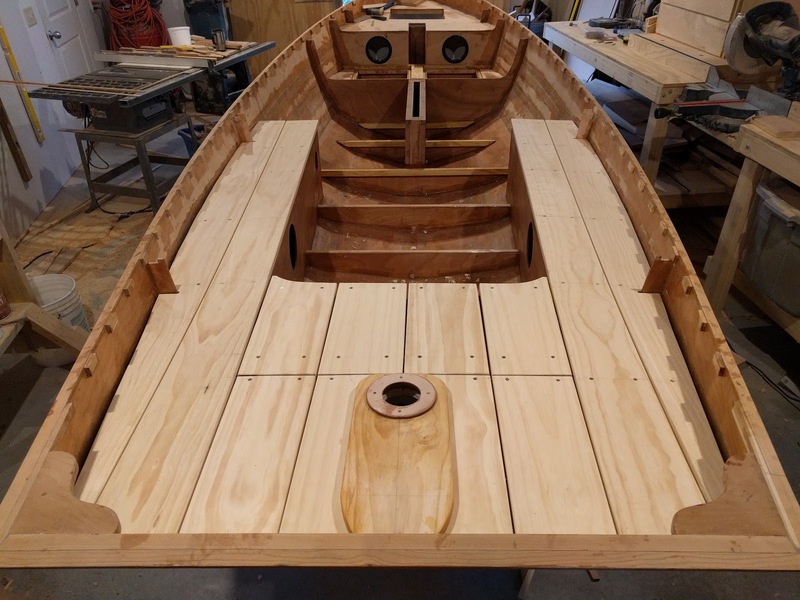 By the time I got home it was dry enough to test fit the planks and I was happy with the look. After that, I cut out all the middle planks that will cover the rear hatch and deck and rough fitted them. 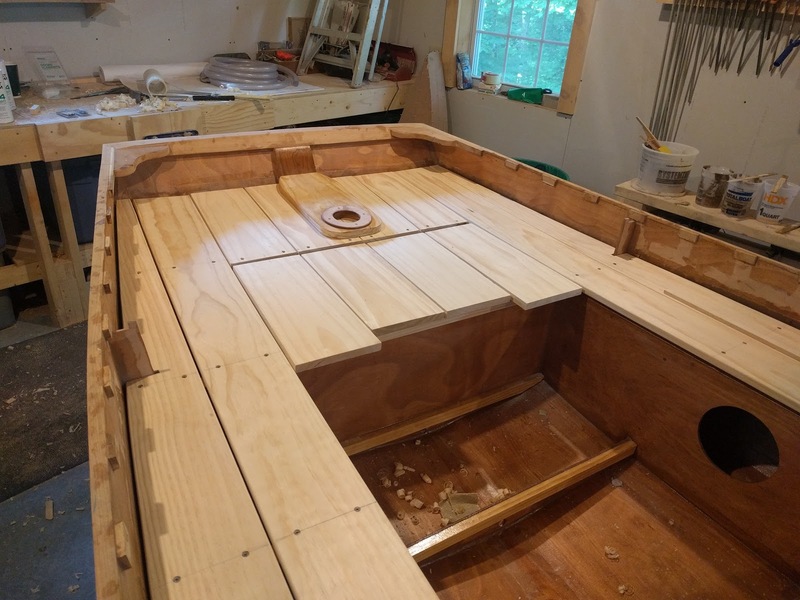 I cut the outboard ones a little bit longer than the middle two because my plan was to strike a slight curve on the aft deck planks to make it a little less boxy. I screwed down the side planks and further refined the aft deck/hatch pieces before taking it all apart again and rounding over all the planks top and bottom with the router. 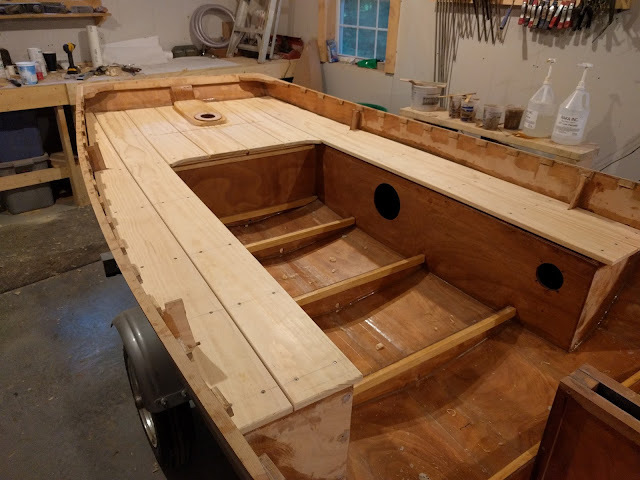 Once again, I screwed everything back in place for a few final fitting adjustments and then drew an arc on each of the hatch corner pieces to cut out. I tried a bunch of different curves, but finally decided that part of the curve on the bottom of the 5 gallon bucket laying in the corner was just about right, so I drew it on and took the pieces over to the band saw followed up by a roundover with the router. So now I have to pull everything apart again (this is getting old) and sand and finish the planks. My plan right now is to use Deks Olje 1 for a matte finish, but I may change my mind on that. Also, I think it's time for a serious date with some sandpaper and get the interior sanded down for primer. I still have the removable thwart to do, and a bunch of work forward, but I'm getting close. 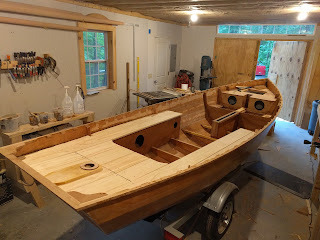 I may sand and then flip the boat for final finish work there, but we'll see.